Eugenie Bouchard found a bit of her old fighting spirit to save seven set points in total and come back from a double break down in both sets and complete a hard-fought 7-6(2), 7-6(7) victory over No.8 seed Viktorija Golubic. 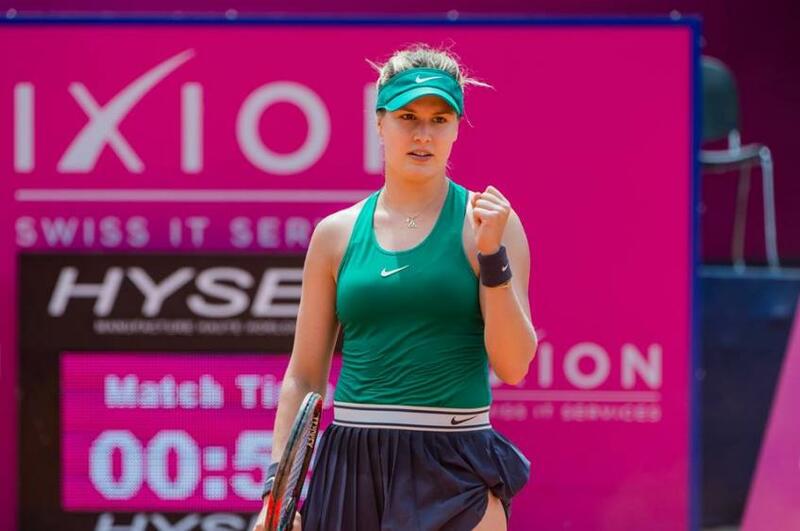 Bouchard claimed her sixth main draw win of the season, the 34th success on clay to move into the first WTA quarterfinals since last February in Taipei City. "I don't even think I'm playing that great," she said, as the WTA website wrote. "Conditions are tough - but I'm just trying to fight. That's what helped me out." Working with new coach Robert Lansdorp, Bouchard has now won back to back matches in three of her last four tournaments. In Gstaad, after her titanic battle to outlast Timea Bacsinszky, she found herself 5-2 down in the opening set against the 2016 champion who began to raise her unforced errors tally. Bouchard stuck to her aggressive, now-or-never approach and her style paid off in the ensuing tiebreak. Bouchard opened the second with an immediate break, but double faults punctuated her next service games with recurring consistency as HGolubic, bidding for her second main draw tour win of the season, went 5-2 up again and made her way to triple set point. On the verge of defeat, Bouchard refused to surrender and fought gloriously back. Golubic saw two further chances to force a decider come and go before Bouchard transformed the tiebreak in a one-sided show of will and desire. She will face qualifier Veronika Kudermetova who saved three set points in total to topple No.3 seed Viktoria Kuzmova 7-6(4) 7-6(5) and put an end to the Slovak's six-match winning streak. Both players served 11 aces, but Kuzmova added 11 decisive double faults. Playing the third WTA main draw of her career, Kudermetova hasn't ceased to improve as she scored a second-round showing in Stuttgart and a quarterfinal in 's-Hertogenbosch. No.1 seed Alizé Cornet reached the quarterfinals after a routine 6-3 6-3 victory over Conny Perrin. Bidding for her first WTA semifinals since 2017 Brisbane, she will face either No.5 seed Samantha Stosur or wildcard Patty Schnyder in the quarterfinals. The Frenchwoman trails Stosur 2-5, all on hard courts, and has not beaten the Australian since the first round clash in 2009 in Beijing, where they played for the last time four years ago. She's tied at 1-1, instead, against Schnyder, with the Swiss winning easily in Prague in 2010 and Cornet extracting revenge a year later in Indian Wells. Yesterday Cornet, who watched in Gstaad the French triumph in the World Cup final against Croatia, confessed her intense love for cats and dogs. An avid book reader, she allowed herself a picturesque travel throughout the city on board of an old coach and stopped to taste a hot chocolate at Charly’s Coffee Shop. "Surely I want to win the title" she said, "but I'm thinking step by step". Mandy Minella upset second-seeded Johanna Larsson and made her first quarterfinal since returning from maternity leave in February. Using her protected ranking of World No.104, she completed the 32nd overall win of the season as she beat the Swede 6-3 6-4 in one hour and 11 minutes. "I could execute my tactical plan from the beginning," she assessed her play. "I think I played very smart, and I could play exactly like I imagined I should play against her - so I guess I had a good day". Minella won 83% of first serve points in the second set and maintained her efficient tactics to make her way into her first WTA quarterfinal since Taipei City in 2017. She will face Sara Sorribes Tormo who won both of their previous meetings in three sets in the qualifying of Marrakech in 2015, and in the first round of the Contrexéville ITF $100,000 event last week. The Spaniard beat Tamara Korpatsch for the second time in two straight years in Gstaad. The world No.83 claimed her 30th career main draw victory to reach her first WTA quarterfinal of the season.